Rediff.com » News » Was Rafale a must for the IAF? The purchase of the 36 Rafales has changed little for the IAF, explains Ajai Shukla. PART 2: Has India paid more for the Rafales? Since the turn of the century, when the Indian Air Force began its quest for cheap, light fighters to replace the Soviet-era fleet of light MiG variants, the IAF's specifications for the replacement fighter have changed so much as to be almost unrecognisable. From supporting development of an indigenous fighter to adding more fighters to the Mirage-2000 fleet, the IAF switched tack to buying medium, multi-role combat aircraft (MMRCA) through competitive global tendering; to eventually buying 36 Rafale fighters in a government-to-government deal with France. In the newest twist, after Prime Minister Narendra D Modi announced on April 10, 2015, in Paris that India would procure 36 Rafale fighters from Dassault, the justification for acquiring such a high-end fighter transformed into veiled hints that it be a platform for delivering nuclear weapons in wartime. 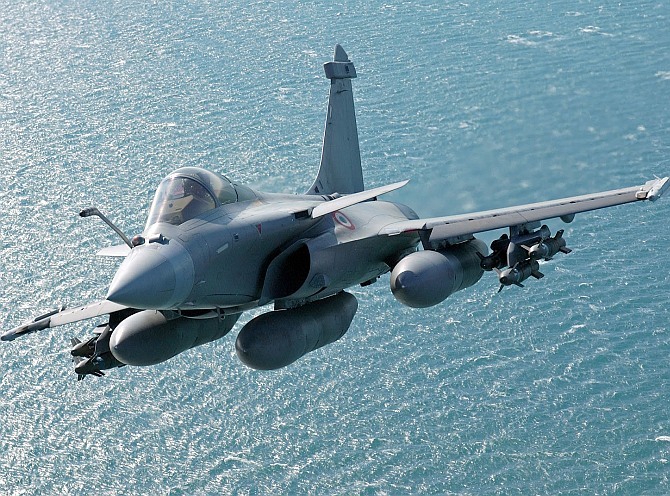 Most nuclear strategists have taken 'strategic purchase' to mean that India would rig Rafale fighters to deliver nuclear weapons -- in place of the Mirage 2000s and Jaguars that currently do the job -- as the airborne leg of its nuclear triad. In the calculations of many analysts, there could be no other valid reason for an air force that already operates seven types of fighters to buy just 36 aircraft of an entirely new type, further complicating a logistical nightmare. Furthermore, nuclear strategists say in the era of highly reliable land-based and submarine-launched ballistic missiles, delivering nuclear weapons by aircraft is a dispensable option. Says Vipin Narang, nuclear strategist at the Massachussetts Institute of Technology: "Given India's diverse and capable land and sea-based missiles, it is worth considering whether one even needs a replacement delivery platform for nuclear gravity bombs." "If India is committed to a triad, a more cost-effective solution may be to make Brahmos a nuclear missile and use the Sukhoi-30MKI to deliver it," adds Narang, "obviating the need to replace the Mirage and Jaguars. It is hard to justify $225 million a plane for an increasingly obsolete mission." If indeed the Rafale's nuclear capability led to its purchase, it remains unclear why the government does not publicly state it? The commitment to a nuclear triad -- of delivery of nukes by land, sea and air -- is publicly enunciated in India's nuclear doctrine. It would be reasonable to state that the IAF is paying such a heavy cost to have the most seamless transition from the Mirage 2000 to another French platform, says Narang. However, there would be questions over whether the Rafale needs to do that job. The Mirage 2000 and the Jaguar are both being upgraded, and can act as airborne nuclear vectors till 2030-35. The nuclear talk is the latest example of the IAF shifting goalposts on its fighter purchase over the past two decades. Since the early 1980s, when the IAF had 42 fighter squadrons but 30 of them were light MiG variants that faced obsolescence, it was decided to develop the indigenous Tejas Light Combat Aircraft (LCA) to replace them. In 1981, the IAF defined a requirement for a light, single-engine to replace the MiGs from the mid-1990s. But the LCA eventually flew only in 2001. The IAF, happy with the performance of the Mirage 2000 in the Kargil war, began lobbying for buying the Mirage production line that Dassault was closing down, and re-establishing it in Hindustan Aeronautics Limited to build the excellent Mirage 2000-5 fighter. "As an air force we were very familiar and comfortable with the operational and tactical handling of the Mirage 2000," said Air Marshal Pranab Kumar Barbora (retd), who was the vice chief of the air staff till 2010. That would have given the IAF large numbers of inexpensive yet sophisticated, single-engine fighters, ideal for replacing the MiGs. But the National Democratic Alliance-I defence minister George Fernandes, under fire after the Tehelka exposes on defence procurement corruption, shied away from a single-vendor buy from Dassault -- ironically, considering what eventually happened with the Rafale purchase 15 years later. In 2002, Fernandes ordered the IAF to float a global tender. Specifications were framed for a light fighter, and the IAF floated a 'Request for Information' to four global vendors in 2004. However, in 2005, Dassault -- apparently miffed at having to compete instead of being awarded a single-vendor contract -- foreclosed the option of transferring the Mirage 2000 line to India. It took the IAF three more years to draw up specifications of a new fighter. On August 28, 2007, when the IAF issued an international tender for what was dubbed the MMRCA, the MiG-replacement fighter had morphed into a high-tech, medium-to-heavy fighter that could have one engine or two, and would inevitably cost far more than what was envisaged. When responses to the tender came in, there were six aircraft in the fray: Saab's JAS-39 Gripen -- C; Lockheed Martin’s F-16 Super Viper; Russian Aircraft Corporation's MiG-35; Boeing's F/A-18E/F Super Hornet; Eurofighter's Typhoon and Dassault's Rafale. A decade later, none of these objectives have been met. With the IAF's operational requirements still unmet with the procurement of just 36 Rafales, fresh tendering is under way for 114 'single-engine fighters'. Instead of a 'competitive, fair and transparent' selection, the decision to buy the Rafale remains opaque. And, with the 'Make in India' component of the deal scrapped, the indigenous defence industry remains ignored. Through the five years it took the IAF to conduct and conclude the MMRCA selection process, the buzz within the defence aerospace community was that the contest structure favoured Dassault. To win, a fighter first had to meet the IAF's requirements in technical evaluation and flight tests. In the second stage of evaluation, commercial bids would be opened of those vendors whose fighters had met the IAF's norms. Based on a 'life-cycle costing' matrix, the lowest bidder would be declared the winner. After lengthy flight trials, the IAF eliminated four fighters in April 2011 -- the Gripen-C, F-16, F/A-18E/F and the MiG-35. Coincidentally, these four were significantly cheaper than the Rafale. Only the excellent, but expensive Eurofighter Typhoon went into a commercial bidding contest against the Rafale. On January 30, 2012, Dassault was informed it was the lowest bidder. Among the fighters the IAF eliminated were the F-16 Super Viper and F/A-18E/F Super Hornet, the world's most combat tested and proven fighters that form the backbone of the world's most formidable air force. Ironically, the IAF is now pursuing two fresh acquisitions -- for single-engine fighter and multi-role carrier-borne fighters, respectively -- in which the F-16 and F/A-18 are hot contenders. Evidently, the purchase of 36 Rafales has changed little for the IAF. Modi vs Manmohan: What's the Rafale cost difference?